Ok, we’ve never been to Finland, but we know many people who have and rave about the country, the people, and the amazing outdoor activities. We don’t, however, usually hear too much about the food of Finland. So, when Evan Kristine offered to give us a primer on her favorite foods of the region, we happily handed over the reins of the blog to her. Evan Kristine Palogan is a cook and traveler, who blogs at www.prettywildworld.com. She moved from her home country of the Philippines to Finland at age 16, and has since adopted Finland as her permanent home. She is, like us, obsessed with the food in the places she visits, and offered to share her favorite dishes from her adopted country. Karelian pie is a Finnish delicacy originating from Karelia, a region located on the eastern side of Finland, bordering on Russia. There are many versions of Karelian pie that you can find at local food stores or in cafes. But the famous ones (and ones you’ll see most often) are the rice Karelian pie and the potato Karelian pie. Nowadays, you can buy this Finnish delicacy from food stores anywhere in Finland. They are not as good as the homemade version (nothing is as good as homemade! ), but the packaged ones aren’t so bad. Plus, they’re cheap! Almost nobody makes this delicacy from scratch anymore, since the process is so time-consuming, particularly if you haven’t done it previously. Typically, grandmothers make these best (or so the Finns say). The taste of this delicacy is hard to explain. I imagine a cooled down rice porridge which you ‘wrap’ in rye dough and then bake in the oven until the crust is crispy. Well, it is unusual, but it is also excellent! I highly suggest hunting one down when you visit Finland at some point. Where do you find Karelian pie? Local food stores, cafés (try the famous Fazer café in Helsinki) or a Finnish granny’s home. Muikku, or vendace, is a species of freshwater whitefish which is commonly found in lakes in Northern Europe, especially in Finland and neighboring countries along the Baltic Sea. Typically you can find Muikku in stores during the warmer periods in Finland. You can also find it when you’re visiting the Market Squares during summer, as it is a traditional Finnish delicacy and the Finns enjoy eating this. Normally, the way they cook this is by rolling the fresh fish on seasoned rye flour and then frying it with butter on a heavy flat skillet until the fish is golden and crispy. It is served with aioli and a slice of lemon. You need to eat this like a local: eat the whole fish as if you’re eating crisps! Don’t fret, though. This fish is small, so the bones are tiny and will not be harmful to you. Muikku is perhaps one of my favorite Finnish delicacies. I don’t end summer without eating tons of this from the nearest market square from my home! In fact, every time a foreign friend comes to visit, I always bring them to one of my favorite market squares to try this out — and they love it, too! Fried muikku is an ultimate local favorite. Where do you find Muikku? Any market square during summer time. Lihapiirakka is yet another common Finnish delicacy you can find almost everywhere in Finland. It is normally sold in local food stores, or you can find it in kiosks around town. 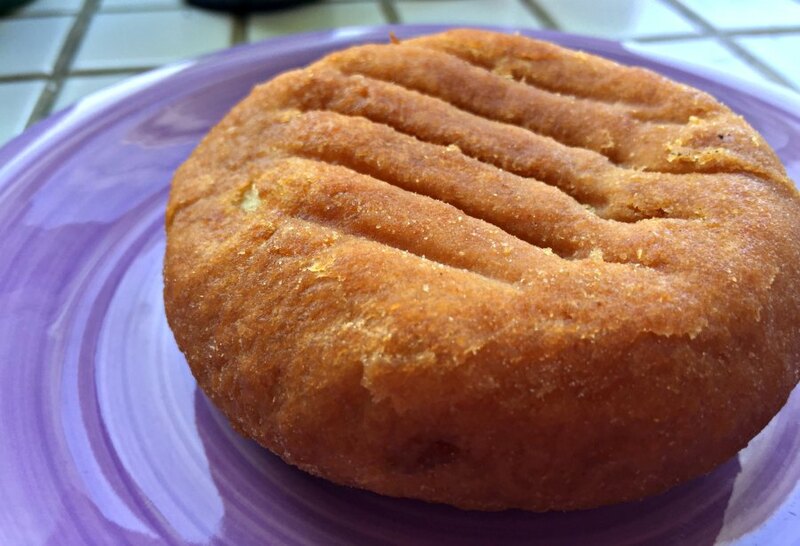 This Finnish delicacy is a doughnut filled with a savory mix of minced meat and rice, all deep fried. It is served warm, and may have other fillings. The traditional way of eating it is by warming up the pie and eating as it is or by filling it with sliced sausage, ketchup, and mustard. Lihapiirakka is a delicious after party food if you’re hungry after dancing all night! The best part is, all the kiosks located in the major cities in Finland sell this dish. Where do you go to find Lihapiirakka? Buy the pre-packaged version in local food stores which you can heat in the microwave or get fresh warm ones from kiosks. Korvapuusti is classically paired with coffee in Finland. It is similar to the American version of the cinnamon roll but with a slight difference. 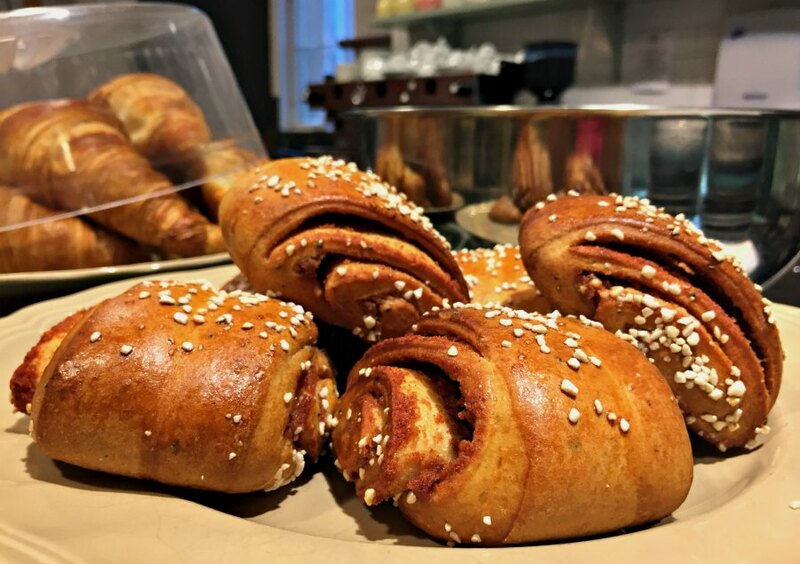 In Finland, this is a typical snack while drinking coffee and all shops and café’s sell this pastry. This Finnish delicacy is so popular that if you’re going to visit a Finnish household, the host will most likely serve you korvapuusti with your coffee. Also, older generations love eating this and making this dish. I remember very well that whenever I visit my family up north, they always have a stock of homemade Finnish cinnamon rolls in the freezer to easily thaw and serve with afternoon coffee. Where do you find korvapuusti? Local food stores and cafés. 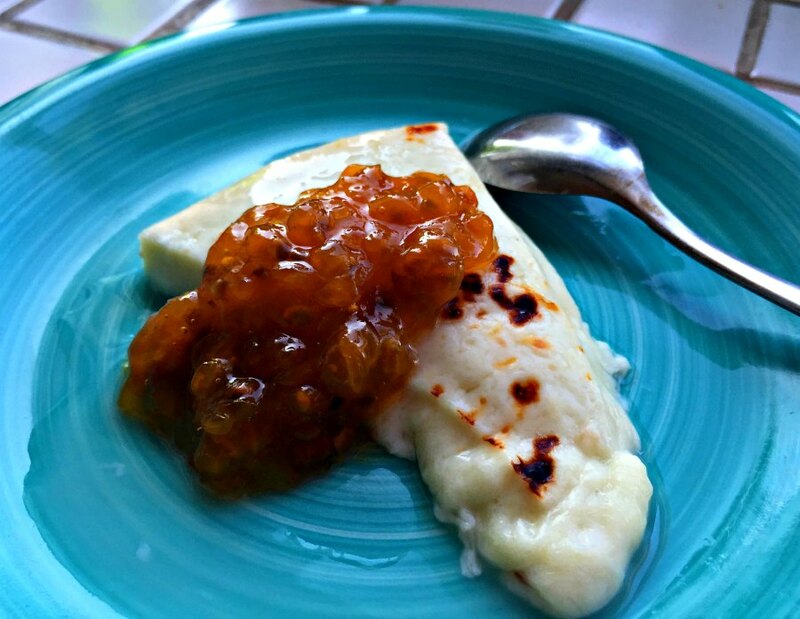 Leipäjuusto is a cheese curd processed into flat bread-like cakes and lakkahillo is a jam made from cloudberries. 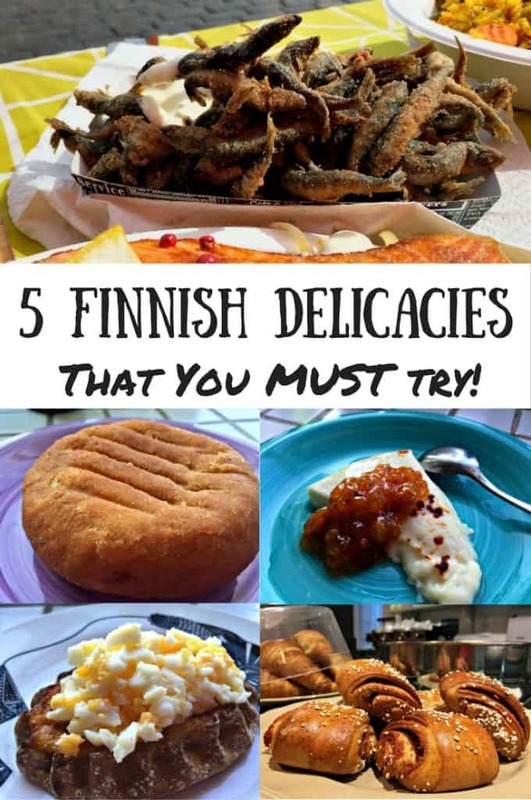 Leipäjuusto and lakkahillo are yet another Finnish delicacy which is a must try if visiting Finland. 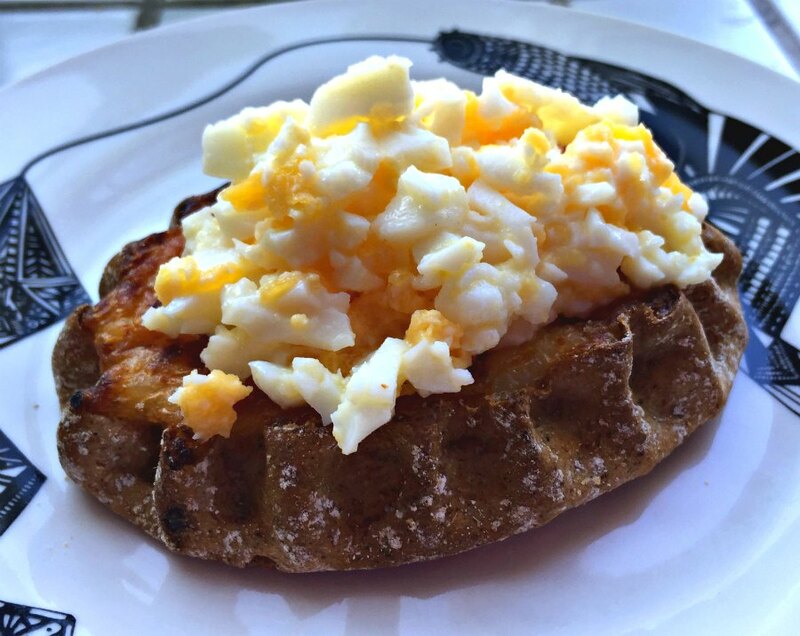 They are typically served with coffee, and normally the cheese curd is warmed first and topped with the cloudberry jam. However, some Finns like to dip the cheese in their warm coffee first to get a chewy texture. This Finnish delicacy is one of my favorites, and I buy this from time to time to serve as a dessert. I sometimes eat this with ice cream as well; it is really good! It may seem weird to eat cheese with something cold and sweet, but it does work. Where do you find leipäjuusto ja lakkahillo? Local food stores and some traditional Finnish restaurants. We thoroughly enjoyed your post! We love the sound of the Muikku. 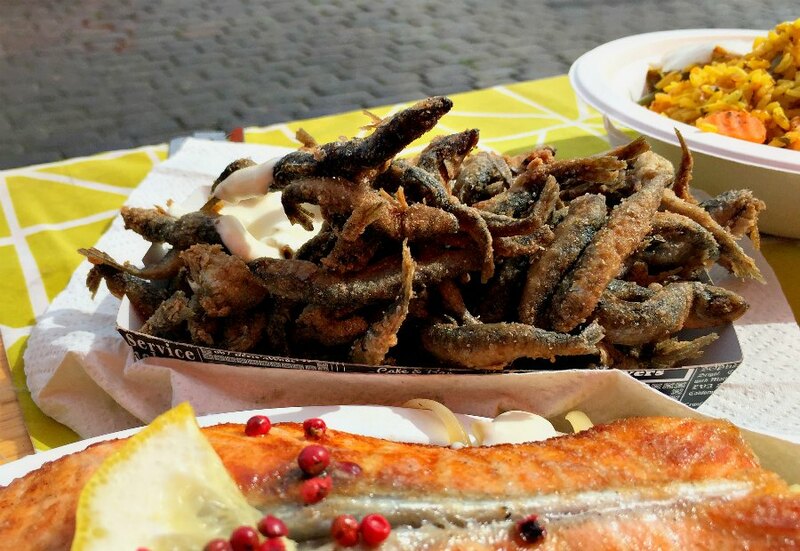 Greek style whitebait is one of our all time favourite dishes so we’re intrigued to see how the Finnish do it!